Jane Eyre follows the emotions and experiences of its eponymous heroine, including her growth to adulthood and her love for Mr. Rochester. In its internalisation of the action—the focus is on the gradual unfolding of Jane's moral and spiritual sensibility, and all the events are coloured by a heightened intensity that was previously the domain of poetry - Jane Eyre revolutionised the art of fiction. Charlotte Brontë has been called the 'first historian of the private consciousness' and the literary ancestor of writers like Proust and Joyce. 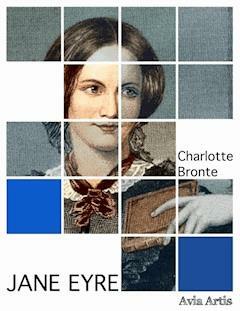 Charlotte Bronte's picture ‌was used in the ‌cover ‌design. All rights for this ‌edition ‌reserved. There was no ‌possibility of taking a ‌walk ‌that day. ‌We ‌had been wandering, indeed, ‌in the ‌leafless shrubbery an hour ‌in the ‌morning; but ‌since dinner ‌(Mrs. Reed, when there ‌was no company, ‌dined early) the cold ‌winter wind had brought ‌with it clouds so ‌sombre, and a rain ‌so penetrating, ‌that ‌further outdoor ‌exercise was now out ‌of the question. I was ‌glad of it; I ‌never liked long walks, ‌especially on chilly ‌afternoons: dreadful to me ‌was the ‌coming home in the ‌raw twilight, ‌with ‌nipped fingers ‌and ‌toes, and a heart ‌saddened by the ‌chidings ‌of ‌Bessie, the nurse, ‌and humbled ‌by ‌the consciousness of ‌my physical inferiority to ‌Eliza, John, and ‌Georgiana Reed. The said Eliza, John, and Georgiana were now clustered round their mamma in the drawing-room: she lay reclined on a sofa by the fireside, and with her darlings about her (for the time neither quarrelling nor crying) looked perfectly happy. Me she had dispensed from joining the group; saying, "She regretted to be under the necessity of keeping me at a distance; but that until she heard from Bessie, and could discover by her own observation, that I was endeavouring in good earnest to acquire a more sociable and childlike disposition, a more attractive and sprightly manner—something lighter, franker, more natural as it were—she really must exclude me from privileges intended only for contented, happy, little children." A small breakfast-room adjoined the drawing-room, I slipped in there. It contained a book-case: I soon possessed myself of a volume, taking care that it should be one stored with pictures. I mounted into the window-seat: gathering up my feet, I sat cross-legged, like a Turk; and, having drawn the red moreen curtain nearly close, I was shrined in double retirement. Nor could I pass unnoticed the suggestion of the bleak shores of Lapland, Siberia, Spitzbergen, Nova Zembla, Iceland, Greenland, with "the vast sweep of the Arctic Zone, and those forlorn regions of dreary space—that reservoir of frost and snow, where firm fields of ice, the accumulation of centuries of winters, glazed in Alpine heights above heights, surround the pole, and concentre the multiplied rigours of extreme cold." Of these death-white realms I formed an idea of my own: shadowy, like all the half-comprehended notions that float dim through children's brains, but strangely impressive. The words in these introductory pages connected themselves with the succeeding vignettes, and gave significance to the rock standing up alone in a sea of billow and spray; to the broken boat stranded on a desolate coast; to the cold and ghastly moon glancing through bars of cloud at a wreck just sinking. Each picture told a story; mysterious often to my undeveloped understanding and imperfect feelings, yet ever profoundly interesting: as interesting as the tales Bessie sometimes narrated on winter evenings, when she chanced to be in good humour; and when, having brought her ironing-table to the nursery-hearth, she allowed us to sit about it, and while she got up Mrs. Reed's lace frills, and crimped her night-cap borders, fed our eager attention with passages of love and adventure taken from old fairy tales and other ballads; or (as at a later period I discovered) from the pages of Pamela, and Henry, Earl of Moreland. "Where the dickens is she?" he continued. "Lizzy! Georgy! (calling to his sisters) Joan is not here: tell mama she is run out into the rain—bad animal!" "It is well I drew the curtain," thought I, and I wished fervently he might not discover my hiding-place: nor would John Reed have found it out himself; he was not quick either of vision or conception; but Eliza just put her head in at the door, and said at once: "She is in the window-seat, to be sure, Jack." "Say, 'What do you want, Master Reed'" was the answer. "I want you to come here;" and seating himself in an arm-chair, he intimated by a gesture that I was to approach and stand before him. John Reed was a schoolboy of fourteen years old; four years older than I, for I was but ten; large and stout for his age, with a dingy and unwholesome skin; thick lineaments in a spacious visage, heavy limbs and large extremities. He gorged himself habitually at table, which made him bilious, and gave him a dim and bleared eye and flabby cheeks. He ought now to have been at school; but his mama had taken him home for a month or two, "on account of his delicate health." Mr. Miles, the master, affirmed that he would do very well if he had fewer cakes and sweetmeats sent him from home; but the mother's heart turned from an opinion so harsh, and inclined rather to the more refined idea that John's sallowness was owing to over-application and, perhaps, to pining after home. John had not much affection for his mother and sisters, and an antipathy to me. He bullied and punished me; not two or three times in the week, nor once or twice in the day, but continually: every nerve I had feared him, and every morsel of flesh in my bones shrank when he came near. There were moments when I was bewildered by the terror he inspired, because I had no appeal whatever against either his menaces or his inflictions; the servants did not like to offend their young master by taking my part against him, and Mrs. Reed was blind and deaf on the subject: she never saw him strike or heard him abuse me, though he did both now and then in her very presence; more frequently, however, behind her back. Then Mrs. Reed subjoined: "Take her away to the red-room, and lock her in there." Four hands were immediately laid upon me, as I was borne upstairs. I resisted all the way; a new thing for me, and a circumstance which greatly strengthened the bad opinion Bessie and Miss Abbot were disposed to entertain of me. The fact is, I was a little trifle beside myself; or rather out of myself, as the French would say: I was conscious that a moment's mutiny had already rendered me liable to strange penalties, and, like any other rebel slave, I felt resolved, in my desperation, to go all lengths. "For shame, for shame!" cried the lady's maid. "What shocking conduct, Miss Eyre, to strike a young gentleman, your benefactress's son! Your young master." They had got me by this time into the apartment indicated by Mrs. Reed, and had thrust me upon a stool: my impulse was to rise from it like a spring; their two pairs of hands arrested me immediately. "If you don't sit still, you must be tied down," said Bessie. "Miss Abbott, lend me your garters; she would break mine directly." Miss Abbott turned to divest a stout leg of the necessary ligature. This preparation for bonds, and the additional ignominy it inferred, took a little of the excitement out of me. "Mind you don't," said Bessie; and when she had ascertained that I was really subsiding, she loosened her hold of me; then she and Miss Abbott stood with folded arms, looking darkly and doubtfully on my face, as incredulous as my sanity. "You ought to be aware, Miss, that you are under obligations to Mrs. Reed: she keeps you: if she were to turn you off, you would have to go to the poor-house." The red-room was a spare chamber, very seldom slept in: I might say never, indeed, unless when a chance influx of visitors at Gateshead Hall rendered it necessary to turn to account all the accommodation it contained: yet it was one of the largest and stateliest chambers in the mansion. A bed supported on massive pillars of mahogany, hung with curtains of deep red damask, stood out like a tabernacle in the centre; the two large windows, with their blinds always drawn down, were half shrouded in festoons and falls of similar drapery; the carpet was red; the table at the foot of the bed was covered with a crimson cloth; the walls were a soft fawn colour with a blush of pink in it; the wardrobe, the toilet table, the chairs, were of darkly polished old mahogany. Out of these deep surrounding shades rose high, and glared white, the piled-up mattresses and pillows of the bed, spread with a snowy Marseilles counterpane. Scarcely less prominent was an ample cushioned easy-chair near the head of the bed, also white, with a footstool before it, and looking, as I thought, like a pale throne. This room was chill, because it seldom had a fire; it was silent, because remote from the nursery and kitchen; solemn, because it was known to be so seldom entered. The housemaid alone came here on Saturdays, to wipe from the mirrors and the furniture a week's quiet dust: and Mrs. Reed herself, at far intervals, visited it to review the contents of a certain secret drawer in the wardrobe, where were stored divers parchments, her jewel-casket, and a miniature of her deceased husband: and in those last words lies the secret of the red-room—the spell which kept it so lonely in spite of its grandeur. All John Reed's violent tyrannies, all his sisters' proud indifference, all his mother's aversion, all the servants' partiality, turned up in my disturbed mind like a dark deposit in a turbid well. Why was I always suffering, always browbeaten, always accused, for ever condemned? Why could I never please? Why was it useless to try to win any one's favour? Eliza, who was headstrong and selfish, was respected. Georgiana, who had a spoiled temper, a very acrid spite, a captious and insolent carriage, was universally indulged. Her beauty, her pink cheeks and golden curls, seemed to give delight to all who looked at her, and to purchase indemnity for every fault. John no one thwarted, much less punished; though he twisted the necks of the pigeons, killed the little pea-chicks, set the dogs at the sheep, stripped the hothouse vines of their fruit, and broke the buds off the choicest plants in the conservatory; he called his mother "old girl," too; sometimes reviled her for her dark skin, similar to his own; bluntly disregarded her wishes; not unfrequently tore and spoiled her silk attire; and he was still "her own darling." I dared commit no fault: I strove to fulfil every duty; and I was termed naughty and tiresome, sullen and sneaking, from morning to noon, and from noon to night. "Unjust!—unjust!" said my reason, forced by the agonising stimulus into precocious though transitory power; and Resolve, equally wrought up, instigated some strange expedient to achieve escape from insupportable oppression—as running away, or, if that could not be effected, never eating or drinking more, and letting myself die. What a consternation of soul was mine that dreary afternoon! How all my brain was in tumult, and all my heart in insurrection! Yet in what darkness, what dense ignorance, was the mental battle fought! I could not answer the ceaseless inward question— why I thus suffered; now, at the distance of—I will not say how many years, I see it clearly. I was a discord in Gateshead Hall; I was like nobody there; I had nothing in harmony with Mrs. Reed or her children, or her chosen vassalage. If they did not love me, in fact, as little did I love them. They were not bound to regard with affection a thing that could not sympathise with one amongst them; a heterogeneous thing, opposed to them in temperament, in capacity, in propensities; a useless thing, incapable of serving their interest, or adding to their pleasure; a noxious thing, cherishing the germs of indignation at their treatment, of contempt of their judgement. I know that had I been a sanguine, brilliant, careless, exacting, handsome, romping child—though equally dependent and friendless—Mrs. Reed would have endured my presence more complacently; her children would have entertained for me more of the cordiality of fellow-feeling; the servants would have been less prone to make me the scapegoat of the nursery. Daylight began to forsake the red-room; it was past four o'clock, and the beclouded afternoon was tending to drear twilight. I heard the rain still beating continuously on the staircase window, and the wind howling in the grove behind the hall; I grew by degrees cold as a stone, and then my courage sank. My habitual mood of humiliation, self-doubt, forlorn depression, fell damp on the embers of my decaying fire. All said I was wicked, and perhaps I might be so: what thought had I been but just conceiving of starving myself to death? That certainly was a crime: and was I fit to die? Or was the vault under the chancel of Gateshead Church an inviting bourne? In such vault I had been told did Mr. Reed lie buried; and led by this thought to recall his idea, I dwelt on it with gathering dread. I could not remember him; but I knew that he was my own uncle—my mother's brother—that he had taken me when a parentless infant to his house; and that in his last moments he had required a promise of Mrs. Reed that she would rear and maintain me as one of her own children. Mrs. Reed probably considered she had kept this promise; and so she had, I dare say, as well as her nature would permit her; but how could she really like an interloper not of her race, and unconnected with her, after her husband's death, by any tie? It must have been most irksome to find herself bound by a hard-wrung pledge to stand in the stead of a parent to a strange child she could not love, and to see an uncongenial alien permanently intruded on her own family group. A singular notion dawned upon me. I doubted not—never doubted—that if Mr. Reed had been alive he would have treated me kindly; and now, as I sat looking at the white bed and overshadowed walls—occasionally also turning a fascinated eye towards the dimly gleaming mirror—I began to recall what I had heard of dead men, troubled in their graves by the violation of their last wishes, revisiting the earth to punish the perjured and avenge the oppressed; and I thought Mr. Reed's spirit, harassed by the wrongs of his sister's child, might quit its abode—whether in the church vault or in the unknown world of the departed—and rise before me in this chamber. I wiped my tears and hushed my sobs, fearful lest any sign of violent grief might waken a preternatural voice to comfort me, or elicit from the gloom some haloed face, bending over me with strange pity. This idea, consolatory in theory, I felt would be terrible if realised: with all my might I endeavoured to stifle it—I endeavoured to be firm. Shaking my hair from my eyes, I lifted my head and tried to look boldly round the dark room; at this moment a light gleamed on the wall. Was it, I asked myself, a ray from the moon penetrating some aperture in the blind? No; moonlight was still, and this stirred; while I gazed, it glided up to the ceiling and quivered over my head. I can now conjecture readily that this streak of light was, in all likelihood, a gleam from a lantern carried by some one across the lawn: but then, prepared as my mind was for horror, shaken as my nerves were by agitation, I thought the swift darting beam was a herald of some coming vision from another world. My heart beat thick, my head grew hot; a sound filled my ears, which I deemed the rushing of wings; something seemed near me; I was oppressed, suffocated: endurance broke down; I rushed to the door and shook the lock in desperate effort. Steps came running along the outer passage; the key turned, Bessie and Abbot entered. "O aunt! have pity! Forgive me! I cannot endure it—let me be punished some other way! I shall be killed if—"
"Something passed her, all dressed in white, and vanished"—"A great black dog behind him"—"Three loud raps on the chamber door"—"A light in the churchyard just over his grave," &c. &c.
At last both slept; the fire and the candle went out. For me, the watches of that long night passed in ghastly wakefulness; strained by dread, such dread as children only can feel. No severe or prolonged bodily illness followed this incident of the red-room; it only gave my nerves a shock, of which I feel the reverberation to this day. Yes, Mrs. Reed, to you I owe some fearful pangs of mental suffering. But I ought to forgive you, for you knew not what you did: while rending my heart-strings, you thought you were only uprooting my bad propensities. Next day, by noon, I was up and dressed, and sat wrapped in a shawl by the nursery hearth. I felt physically weak and broken down: but my worse ailment was an unutterable wretchedness of mind: a wretchedness which kept drawing from me silent tears. No sooner had I wiped one salt drop from my cheek than another followed. Yet I thought I ought to have been happy, for none of the Reeds were there—they were all gone out in the carriage with their mama. Abbot, too, was sewing in another room, and Bessie, as she moved hither and thither, putting away toys and arranging drawers, addressed to me every now and then a word of unwonted kindness. This state of things should have been to me a paradise of peace, accustomed as I was to a life of ceaseless reprimand and thankless fagging; but, in fact, my racked nerves were now in such a state that no calm could soothe, and no pleasure excite them agreeably. Bessie had been down into the kitchen, and she brought up with her a tart on a certain brightly painted china plate, whose bird of paradise, nestling in a wreath of convolvuli and rosebuds, had been wont to stir in me a most enthusiastic sense of admiration; and which plate I had often petitioned to be allowed to take in my hand in order to examine it more closely, but had always hitherto been deemed unworthy of such a privilege. This precious vessel was now placed on my knee, and I was cordially invited to eat the circlet of delicate pastry upon it. Vain favour! coming like most other favours long deferred and often wished for, too late! I could not eat the tart; and the plumage of the bird, the tints of the flowers, seemed strangely faded! I put both plate and tart away. Bessie asked if I would have a book: the word book acted as a transient stimulus, and I begged her to fetch Gulliver's Travels from the library. This book I had again and again perused with delight. I considered it a narrative of facts, and discovered in it a vein of interest deeper than what I found in fairy tales; for as to the elves, having sought them in vain among foxglove leaves and bells, under mushrooms and beneath the ground-ivy mantling old wall-nooks, I had at length made up my mind to the sad truth, that they were all gone out of England to some savage country where the woods were wilder and thicker, and the population more scant; whereas, Lilliput and Brobdingnag being, in my creed, solid parts of the earth's surface, I doubted not that I might one day, by taking a long voyage, see with my own eyes the little fields, houses, and trees, the diminutive people, the tiny cows, sheep, and birds of the one realm; and the cornfields forest-high, the mighty mastiffs, the monster cats, the tower-like men and women, of the other. Yet, when this cherished volume was now placed in my hand—when I turned over its leaves, and sought in its marvellous pictures the charm I had, till now, never failed to find—all was eerie and dreary; the giants were gaunt goblins, the pigmies malevolent and fearful imps, Gulliver a most desolate wanderer in most dread and dangerous regions. I closed the book, which I dared no longer peruse, and put it on the table beside the untasted tart. I had often heard the song before, and always with lively delight; for Bessie had a sweet voice—at least, I thought so. But now, though her voice was still sweet, I found in its melody an indescribable sadness. Sometimes, preoccupied with her work, she sang the refrain very low, very lingeringly; "A long time ago" came out like the saddest cadence of a funeral hymn. She passed into another ballad, this time a really doleful one. "My feet they are sore, and my limbs they are weary; ⁠Long is the way, and the mountains are wild; Soon will the twilight close moonless and dreary ⁠Over the path of the poor orphan child. Why did they send me so far and so lonely, ⁠Up where the moors spread and grey rocks are piled? Men are hard-hearted, and kind angels only ⁠Watch o'er the steps of a poor orphan child. Yet distant and soft the night breeze is blowing, ⁠Clouds there are none, and clear stars beam mild, God, in His mercy, protection is showing, ⁠Comfort and hope to the poor orphan child. Ev'n should I fall o'er the broken bridge passing, ⁠Or stray in the marshes, by false lights beguiled, Still will my Father, with promise and blessing, ⁠Take to His bosom the poor orphan child. "There is a thought that for strength should avail me; ⁠Though both of shelter and kindred despoiled; Heaven is a home, and a rest will not fail me; ⁠God is a friend to the poor orphan child." "Then she ought to look more cheerful. Come here, Miss Jane; your name is Jane, is it not?" The good apothecary appeared a little puzzled. I was standing before him; he fixed his eyes on me very steadily: his eyes were small and grey; not very bright, but I dare say I should think them shrewd now; he had a hard-featured yet good-natured looking face. Having considered me at leisure, he said—"What made you ill yesterday?" As he was returning the box to his waistcoat pocket, a loud bell rang for the servant's dinner; he knew what it was. "That's for you, nurse," said he; "you can go down; I'll give Miss Jane a lecture till you come back." "The fall did not make you ill; what did, then?" pursued Mr. Lloyd, when Bessie was gone. "I was shut up in a room where there is a ghost, till after dark." "Of Mr. Reed's ghost I am: he died in that room, and was laid out there. Neither Bessie nor any one else will go into it at night, if they can help it; and it was cruel to shut me up alone without a candle—so cruel that I think I shall never forget it." "No: but night will come again before long: and besides—I am unhappy—very unhappy, for other things." "But John Reed knocked me down, and my aunt shut me up in the red-room." "Perhaps you may—who knows? Have you any relations besides Mrs. Reed?" "I cannot tell; Aunt Reed says if I have any, they must be a beggarly set: I should not like to go a begging." Again I reflected: I scarcely knew what school was; Bessie sometimes spoke of it as a place where young ladies sat in the stocks, wore backboards, and were expected to be exceedingly genteel and precise: John Reed hated his school, and abused his master; but John Reed's tastes were no rule for mine, and if Bessie's accounts of school-discipline (gathered from the young ladies of a family where she had lived before coming to Gateshead) were somewhat appalling, her details of certain accomplishments attained by these same young ladies were, I thought, equally attractive. She boasted of beautiful paintings of landscapes and flowers by them executed; of songs they could sing and pieces they could play, of purses they could net, of French books they could translate; till my spirit was moved to emulation as I listened. Besides, school would be a complete change, it implied a long journey, an entire separation from Gateshead, an entrance into a new life. Bessie invited him to walk into the breakfast-room, and led the way out. In the interview which followed between him and Mrs. Reed, I presume, from after-occurrences, that the apothecary ventured to recommend my being sent to school; and the recommendation was no doubt readily enough adopted; for as Abbot said, in discussing the subject with Bessie when both sat sewing in the nursery one night, after I was in bed, and, as they thought, asleep, "Missis was, she dared say, glad enough to get rid of such a tiresome, ill-conditioned child, who always looked as if she were watching everybody, and scheming plots underhand." Abbot, I think, gave me credit for being a sort of infantine Guy Fawkes. On that same occasion I learned, for the first time, from Miss Abbot's communications to Bessie, that my father had been a poor clergyman; that my mother had married him against the wishes of her friends, who considered the match beneath her; that my grandfather Reed was so irritated at her disobedience, he cut her off without a shilling, that after my mother and father had been married a year, the latter caught the typhus fever while visiting among the poor of a large manufacturing town where his curacy was situated, and where that disease was then prevalent; that my mother took the infection from him, and both died within a month of each other. "Poor Miss Jane is to be pitied, too, Abbot." "Not a great deal, to be sure," agreed Bessie; "at any rate, a beauty like Miss Georgiana would be more moving in the same condition." "Yes, I dote on Miss Georgiana!" cried the fervent Abbot. "Little darling!—with her long curls and her blue eyes, and such a sweet colour as she has; just as if she were painted!—Bessie, I could fancy a Welsh rabbit for supper." "So could I—with a roast onion. Come, we'll go down." They went. From my discourse with Mr. Lloyd, and from the above reported conference between Bessie and Abbot, I gathered enough of hope to suffice as a motive for wishing to get well. A change seemed near—I desired and waited it in silence. It tarried, however; days and weeks passed. I had regained my normal state of health, but no new allusion was made to the subject over which I brooded. Mrs. Reed surveyed me at times with a severe eye, but seldom addressed me. Since my illness she had drawn a more marked line of separation than ever between me and her own children, appointing me a small closet to sleep in by myself, condemning me to take my meals alone, and pass all my time in the nursery, while my cousins were constantly in the drawing-room. Not a hint, however, did she drop about sending me to school; still I felt an instinctive certainty that she would not long endure me under the same roof with her; for her glance, now more than ever, when turned on me, expressed an insuperable and rooted aversion. "Don't talk to me about her, John; I told you not to go near her; she is not worthy of notice. I do not choose that either you or your sisters should associate with her." Mrs. Reed was rather a stout woman; but, on hearing this strange and audacious declaration, she ran nimbly up the stair, swept me like a whirlwind into the nursery, and crushing me down on the edge of my crib, dared me in an emphatic voice to rise from that place, or utter one syllable, during the remainder of the day. "What would Uncle Reed say to you, if he were alive?" was my scarcely voluntary demand. I say scarcely voluntary, for it seemed as if my tongue pronounced words without my will consenting to their utterance; something spoke out of me over which I had no control. "What?" said Mrs. Reed under her breath; her usually cold composed grey eye became troubled with a look like fear; she took her hand from my arm, and gazed at me as if she really did not know whether I were child or fiend. I was now in for it. "My Uncle Reed is in heaven, and can see all you do and think; and so can papa and mama; they know how you shut me up all day long, and how you wish me dead." Mrs. Reed soon rallied her spirits, she shook me most soundly, she boxed both my ears, and then left me without a word. Bessie supplied the hiatus by a homily of an hour's length, in which she proved beyond a doubt that I was the most wicked and abandoned child ever reared under a roof. I half believed her, for I felt, indeed, only bad feelings surging in my breast. November, December, and half of January passed away. Christmas and the New Year had been celebrated at Gateshead with the usual festive cheer; presents had been interchanged, dinners and evening parties given. From every enjoyment I was, of course, excluded; my share of the gaiety consisted in witnessing the daily apparelling of Eliza and Georgiana, and seeing them descend to the drawing-room, dressed out in thin muslin frocks and scarlet sashes, with hair elaborately ringleted; and afterwards, in listening to the sound of the piano or the harp played below, to the passing to and fro of the butler and footman, to the jingling of glass and china as refreshments were handed, to the broken hum of conversation as the drawing-room door opened and closed. When tired of this occupation, I would retire from the stairhead to the solitary and silent nursery; there, though somewhat sad, I was not miserable. To speak truth, I had not the least wish to go into company, for in company I was very rarely noticed; and if Bessie had but been kind and companionable, I should have deemed it a treat to spend the evenings quietly with her, instead of passing them under the formidable eye of Mrs. Reed, in a room full of ladies and gentlemen. But Bessie, as soon as she had dressed her young ladies, used to take herself off to the lively regions of the kitchen and housekeeper's room, generally bearing the candle along with her. I then sat with my doll on my knee, till the fire got low, glancing round occasionally to make sure that nothing worse than myself haunted the shadowy room; and when the embers sank to a dull red, I undressed hastily, tugging at knots and strings as I best might, and sought shelter from cold and darkness in my crib. To this crib I always took my doll; human beings must love something, and, in the dearth of worthier objects of affection, I contrived to find a pleasure in loving and cherishing a faded graven image, shabby as a miniature scarecrow. It puzzles me now to remember with what absurd sincerity I doted on this little toy, half fancying it alive and capable of sensation. I could not sleep unless it was folded in my night-gown; and when it lay there safe and warm, I was comparatively happy, believing it to be happy likewise. Long did the hours seem while I waited the departure of the company, and listened for the sound of Bessie's step on the stairs. Sometimes she would come up in the interval to seek her thimble or her scissors, or perhaps to bring me something by way of supper—a bun or a cheesecake—then she would sit on the bed while I ate it, and when I had finished, she would tuck the clothes round me, and twice she kissed me, and said, "Good night, Miss Jane." When thus gentle, Bessie seemed to me the best, prettiest, kindest being in the world; and I wished most intensely that she would always be so pleasant and amiable, and never push me about, or scold, or task me unreasonably, as she was too often wont to do. Bessie Lee must, I think, have been a girl of good natural capacity, for she was smart in all she did, and had a remarkable knack of narrative; so, at least, I judge from the impression made on me by her nursery tales. She was pretty, too, if my recollections of her face and person are correct. I remember her as a slim young woman, with black hair, dark eyes, very nice features, and good, clear complexion; but she had a capricious and hasty temper, and indifferent ideas of principle or justice; still, such as she was, I preferred her to any one else at Gateshead Hall. It was the fifteenth of January, about nine o'clock in the morning. Bessie was gone down to breakfast; my cousins had not yet been summoned to their mama; Eliza was putting on her bonnet and warm garden-coat to go and feed her poultry—an occupation of which she was fond, and not less so of selling the eggs to the housekeeper and hoarding up the money she thus obtained. She had a turn for traffic, and a marked propensity for saving—shown not only in the vending of eggs and chickens, but also in driving hard bargains with the gardener about flower-roots, seeds, and slips of plants—that functionary having orders from Mrs. Reed to buy of his young lady all the products of her parterre she wished to sell; and Eliza would have sold the hair off her head if she could have made a handsome profit thereby. As to her money, she first secreted it in odd corners, wrapped in a rag or an old curl-paper; but some of these hoards having been discovered by the housemaid, Eliza, fearful of one day losing her valued treasure, consented to intrust it to her mother, at a usurious rate of interest—fifty or sixty per cent.—which interest she exacted every quarter, keeping her accounts in a little book with anxious accuracy. Georgiana sat on a high stool, dressing her hair at the glass, and interweaving her curls with artificial flowers and faded feathers, of which she had found a store in a drawer in the attic. I was making my bed, having received strict orders from Bessie to get it arranged before she returned (for Bessie now frequently employed me as a sort of under-nursery-maid, to tidy the room, dust the chairs, &c.). Having spread the quilt and folded my night-dress, I went to the window-seat to put in order some picture-books and doll's house furniture scattered there; an abrupt command from Georgiana to let her playthings alone (for the tiny chairs and mirrors, the fairy plates and cups, were her property) stopped my proceedings; and then, for lack of other occupation, I fell to breathing on the frost-flowers with which the window was fretted, and thus clearing a space in the glass through which I might look out on the grounds, where all was still and petrified under the influence of a hard frost. From this window were visible the porter's lodge and the carriage-road, and just as I had dissolved so much of the silver-white foliage veiling the panes as left room to look out, I saw the gates thrown open and a carriage roll through. I watched it ascending the drive with indifference; carriages often came to Gateshead, but none ever brought visitors in whom I was interested; it stopped in front of the house, the door-bell rang loudly, the new-comer was admitted. All this being nothing to me, my vacant attention soon found livelier attraction in the spectacle of a little hungry robin, which came and chirruped on the twigs of the leafless cherry-tree nailed against the wall near the casement. The remains of my breakfast of bread and milk stood on the table, and, having crumbled a morsel of roll, I was tugging at the sash to put out the crumbs on the window-sill, when Bessie came running upstairs into the nursery. "Miss Jane, take off your pinafore; what are you doing there? Have you washed your hands and face this morning?" "Troublesome, careless child!—and what are you doing now? You look quite red, as if you had been about some mischief; what were you opening the window for?" I was spared the trouble of answering, for Bessie seemed in too great a hurry to listen to explanations; she hauled me to the washstand, inflicted a merciless, but happily brief, scrub on my face and hands with soap, water, and a coarse towel; disciplined my head with a bristly brush, denuded me of my pinafore, then hurrying me to the top of the stairs, bid me go down directly, as I was wanted in the breakfast-room. I would have asked who wanted me—I would have demanded if Mrs. Reed was there, but Bessie was already gone, and had closed the nursery-door upon me. I slowly descended. For nearly three months, I had never been called to Mrs. Reed's presence; restricted so long to the nursery, the breakfast, dining, and drawing rooms were become for me awful regions, on which it dismayed me to intrude. "Who could want me?" I asked inwardly, as with both hands I turned the stiff door-handle which, for a second or two, resisted my efforts. "What should I see besides Aunt Reed in the apartment?—a man or a woman?" The handle turned, the door unclosed, and passing through, and curtseying low, I looked up at—a black pillar!—such, at least, appeared to me, at first sight, the straight, narrow, sable-clad shape standing erect on the rug; the grim face at the top was like a carved mask, placed above the shaft by way of capital. "This is the little girl respecting whom I applied to you." "Her size is small; what is her age?" Impossible to reply to this in the affirmative; my little world held a contrary opinion: I was silent. Mrs. Reed answered for me by an expressive shake of the head, adding soon, "Perhaps the less said on that subject the better, Mr. Brocklehurst." "Sorry indeed to hear it! she and I must have some talk;" and bending from the perpendicular, he installed his person in the armchair opposite Mrs. Reed's. "Come here," he said. "And should you like to fall into that pit, and to be burning there forever?" I deliberated a moment; my answer, when it did come, was objectionable; "I must keep in good health, and not die." "How can you keep in good health? Children younger than you die daily. I buried a little child of five years old only a day or two since—a good little child, whose soul is now in heaven. It is to be feared the same could not be said of you, were you to be called hence."